Autumn is now giving way to winter and water temperatures are plummeting, however the trout are still a realistic target especially if you adopt the right tactics. If you are boat fishing, try to locate the fry shoals as the trout are never far away from their desired food source at this time of year. Spinning is an obvious choice, just fish them a bit slower and deeper and the same goes for the fly fisherman. Fish sinking lines and lures such as cats whiskers, sparklers and booby patterns for the best results. If you are worm fishing then set your float deeper than usual or if you are bank fishing then leger tactics are the way forward and don’t forget although we are still open for trout fishing ALL Brown trout must be returned until 15th March, however rainbows can still be retained! Stuart Bell from Manchester fished boobies on a Di-7 set up from the boats to record 3 browns to 2lb+ from the boats. Also Peter Johnson from Berkshire fished a sinking line set up and various fry patterns including zonkers and floating fry and landed 4 browns to 2lb, again from the boats. Meanwhile Jimmy Brown from Darlington had a nice brace of browns on spinners from the bank and John Dean from Carlisle also landed 3 browns to 3lb from the boathouse banking on legered worm! 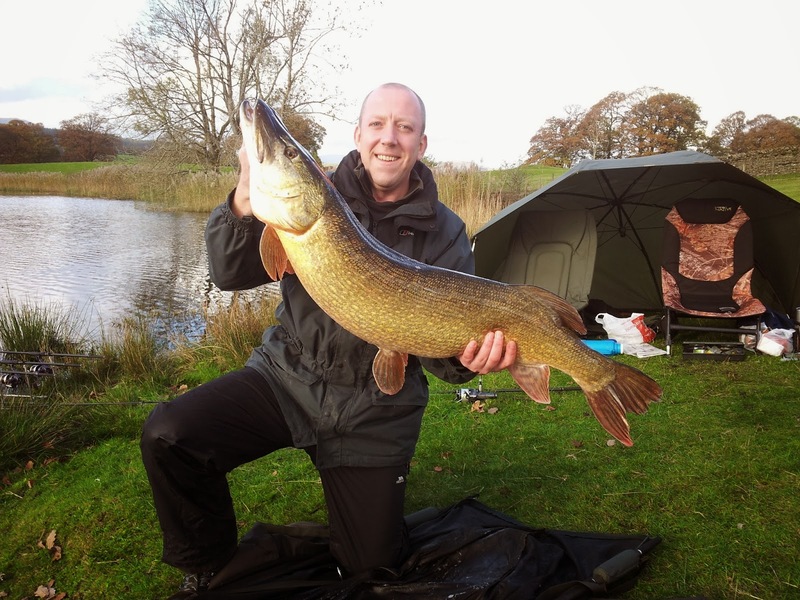 The Pike fishing has been a bit patchy over the last few weeks as it nearly always is during the autumn. Despite this there has been some very big fish reported indeed from both the bank and the boats! First up Mark Carding from Barrow landed a 20lb 2oz Pike on trolled deadbait from the boats. Big s club member John Ashurst from Wigan took a 17lb Pike on a trolled replicant, again from the boats. Meanwhile Chris Oakes landed 3 Pike upto 12lb on lures from the boats. Steve Brookes from St Helens landed 4 Pike up to 23lb 4oz on deadbaits and lures from the boats. However the best recent Pike was taken on static deadbait from the banking at 10 tree bay and was landed by Steve Logan from Barrow. The fish was immaculate and tipped the scales at 27lb 8oz (see attached photo). Don’t forget we offer a first class guiding service. Anyone interested in having a day with our resident guides should contact Dave or Alex on 015394 36541 for more information and for daily updates please find us on Facebook or follow us on Twitter! Our general coarse fishing is becoming very popular and regular bags of 20-30lb nets of Roach, Rudd, Perch and Bream are being caught from the boathouse banking or from the point opposite the ticket office. Tickets cost just £10 and the use of maggots is permitted. Quivertipping tactics is by far the best approach. The tickets are available until 14th March!